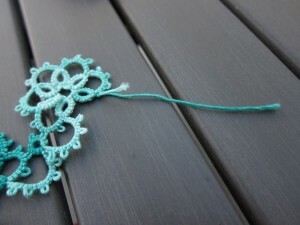 Today I made the oh-so emotional decision to cut off a piece of perfectly good tatting. Well, I made the decision a while back, but couldn’t bring myself to actually do the cutting. Today I tackled it on my lunch break. 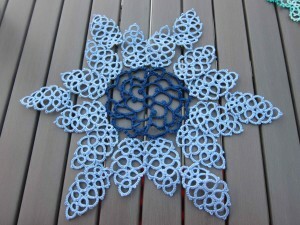 I’ve been working on this large doily from the Priscilla Tatting Book #3. I want to make one in size 20, but wanted first to figure out a more effective way to make it since the original directions call for making all the motifs separately and putting it together at the end. I wanted to figure out how to piece it together while tatting. To help with that I started this one in size 3 so that I could easily look back later and see what I’d done. 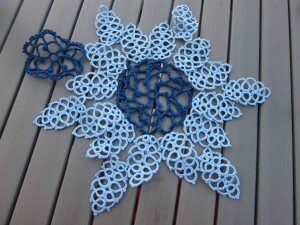 This is such an elaborate doily that size 3 should work out to a small tablecloth. I got as far as the first picture when I discovered that Michaels and Joanns have stopped carrying the Royle Brand thread that I’m using for this. I think actually it’s been bought by Aunt Lydia because that’s what they both have instead and I’d never seen that before. Unfortunately, they don’t seem to have the same colors. The light blue matches to some extent, but there’s no dark blue at all. I have enough to thread to make the rest of the dark blue motifs around this bit, but not beyond that. I didn’t think I’d like the way it would work if I just stopped at that point. I could make the rest of it in white and just have a blue center, but that didn’t really appeal to me either. So I decided to just cut off the last motif that I made and call it done. "Maybe it can be a barrette." My co-worker thought it was sad to throw away the motif that I had to cut off. Considering the number of knot-stitches in the motif I thought it was pretty sad too, but not worth the trouble to make something out of it. So I trashed the little cut up motif and I’m moving on to the next project. It’s nice to finish up a large project even if it didn’t end up as large as I originally planned and even if it required a pair of scissors to do it. I’ll still eventually make the whole thing but for now I’m happy to have figured out how to make the leaves two at a time so that I have less ends to hid. A couple weeks ago I decided to try dying some of my own thread. Actually, I decided quite a while ago that I wanted to give it a try, but hadn’t gotten around to it. Then a couple weeks ago I had a dream in which I was wearing a dress decorated with hand-dyed-thread of a very specific color. 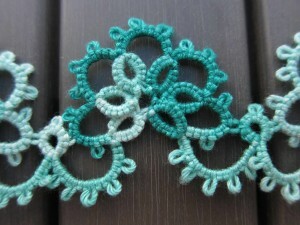 The next day while teaching my tatting class at Piecemakers in Costa Mesa I found that they had two random boxes of r.i.t. dye, one of which looked like it was exactly the color I dreamed about. Of course, I had to get it and try it that very night. Nevermind that I was visiting my parents that night or that I got to their place after 10pm. Luckily they were out of town that night and wouldn’t be back until late the next day so I was able to stay up until 5am dying thread. I already had a bunch of skeins wound up because I had a couple balls of a not-very-good white thread that I wanted to use up, but didn’t know what to do with. I figured I’d sacrifice them to my dying experiments since I wouldn’t be very upset if they were wasted. So I had a couple skeins wound of size 30 of some unknown brand and a bunch of size 10 in Royal. Years ago I bought 3 of the gigantic skeins of Royal in white and I’d only used about a half of one. By the end of the night of playing with dye I’d finished that one off and made a pretty good dent in the second. I also wanted to try dying thread with food coloring so I did that first. Didn’t really work for me. I added a few drops of food coloring and vinegar to the hot water (the way that I dye eggs), and when I rinsed the thread all the color washed out and I was left with some very pastel colors which weren’t really what I was going for. I left it out to dry and even though I thought I’d gotten all the color that was going to wash out it still left a faint bit of color on the papertowels when I went back to look at it, so I think it will probably still fade a bit more with time. After the food coloring failed I switched to the real fabric dye and not surprisingly it worked great. Mostly I was just experimenting and trying things out with the amount of dye and the length of time the thread was left in the water. I tried a couple variegated skeins and they worked pretty well. 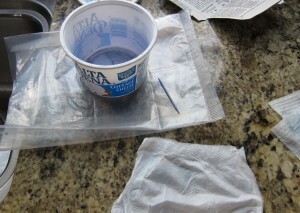 My modest dying bucket was a cottage cheese container. I put it on a piece of plastic (actually a old cearal bag) that hung over the sink so when I made the varigates by hanging the skein over the side it would drain into the sink. I ended up making a lot more than I intended to, but I figured as long as I had dye left in the water I should just keep winding up skeins and playing around with it. Seemed like a shame to waste the dye so I just kept adding hot water and going and going until it was 5am. 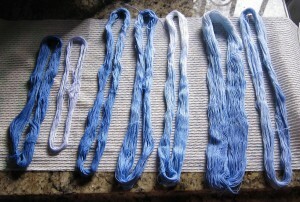 The dyed thread kept getting fainter and fainter and finally I left one last skein in the water and went to bed. When I woke up it had soaked up the rest of the water and the dye and looked pretty nice. They dried pretty slowly just sitting on the counter so I ended up taking a hair drier to them to try to get my parents kitchen back to normal by the time they got home. I’ve done a bit of tatting with the thread since then and I like the way it came out. It wasn’t very uniform and I have a lot more respect for all the thread dyers out there who are able to make an exact science out of it and end up with a uniform product. Since I wasn’t really going for any specific colors or variegates it all looks great to me. Decided to take on another pattern from the Priscilla books. I really liked the scallops on this edging. 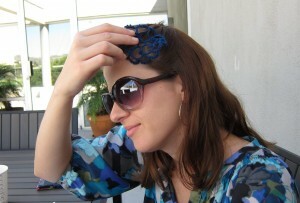 So I gave it a go with some thread that I picked up at Piecemakers in Costa Mesa after teaching there. This was an old ball of thread so it was sort of rough and tricky to tat with and there wasn’t much left on it, but I really liked the color so I decided to just go with it and tat a nice edging until I ran out. Got about a yard or so out of it. The title of this post comes from the fact that I really tried to push it and get just out one more repeat of the pattern. I got it, but look what I had left to work with! About 4 inches on one thread and less than an inch on the other. I was amazed I made it work. Would have been depressing to have it come so close and not work and to have to go back and cut in down to one repeat less. No hiding in ends for this on. I just tied and cut. I figure that was appropriate since both the thread and pattern are from a time when that was the standard practice. Not actually sure what I’m going to do with it but it looks pretty. I’m thinking maybe put it on a pillowcase or something. I’ll go through the pattern in another post. I expect I’ll do a lot more with it. I think it’d look very nice in a small thread with some beads so maybe next time I try size 80. Wow. Has it really been that long since I’ve posted? I haven’t stopped tatting, but been so busy with a lot of travel that I haven’t had a set routine for more than a few days which is what I need to get myself posting. We’re about to start a pledge drive here at the public radio station that I work at so things are about to get real busy, but expect them to also settle into a routine and hopefully I’ll get some more posting done to type up all the fun stuff I’ve been doing. One very cool thing I did last month was to teach at Camp Wannatat. Yes. That’s right. I TAUGHT at Camp Wannatat. Considering what an honor I find it to be just to go, you can imagine what a thrill it was to get to teach my coin purse there. 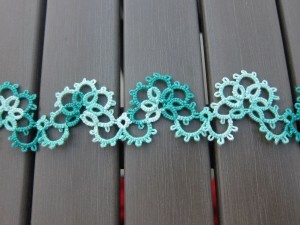 Many other tatting things have been done over the last few weeks. I need to take lots of pictures and do lots of posting!